The bag space cap has been increased. You can now purchace slots, up to the max of 100 bag slots! Rare hunters can now REJOICE! Access it through your inventory screen or through the HALdroid. 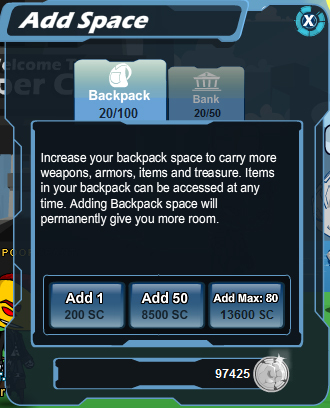 As a bonus for player appreciation we have added a button for 50 bag slots for the price of 8500 SmachCoins. That's a huge value!